Leviathan – The government’s top recruited mutant. An expert marine who was struck by the radiation while working in Afghanistan. His body is dark with a thick exoskeleton. Leviathan’s powers include super-strength, a heat-resistant body, and fiery breath. Keynes – A transformed IRS agent. He attains great speed enhanced with a special suit from the government. His body has super-human healing and strength. He is known to be witty and deceiving. Stape – A mutated ape who gains super-genius intelligence. He wears a hyper-strength enhanced suit from the government and moonlights as a government researcher. 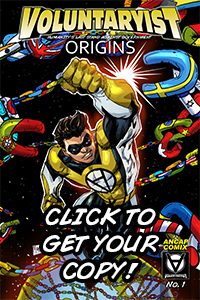 Archist – A mutated human who was hit by the radiation but only survived because the government saved him, turned him into a cyborg, and tweaked his DNA. His body incorporates roach and ant genes, giving him a hard partial exoskeleton and super-strength. His cyborg portion has a computer providing enhanced environmental analysis. Extra weapons include lasers, machine guns, stun projectiles, and grenades. Majority (Jennifer Civil Rybart) – A city councilwoman struck with the black-hole energy while working on a condemnation project. She has the ability to absorb energy from other’s energy streams and deflect/resend their waves. She can control and manipulate electricity as well. National (Sara Isabella McBride)– A teenager who worked for the wildlife commission. She was hit by the cosmic energy and fell off a cliff while hiking, causing her to collide with a school of fish. She gained protective shimmering scales on her body and streamlined fins. National has the ability to breathe underwater and swim with incredible speed. She can manipulate moisture in the air and water, changing its state. She can also protrude sharp spines out of hands and back and also launch them. National has certain telepathic abilities with sea-dwelling creatures she comes into contact with. Kaiser Kim-Jong – Kim Jong-il’s body resurrected using a mimicked version of the black-hole radiation. North Korean scientists manage to resuscitate Kim Jong using the artificial black-hole radiation module that is built into a robotic suit. The suit was built using a Nazi-era schematics guide and the neuron-computer system was created by Chinese government scientists whose work was exchanged for radiated rocks from the black-hole event. The suit contains various deadly weapons, but the most dangerous is the black-hole generator itself which, if exposed outside its container, weakens the powers of those who were naturally affected by the black-hole event. The box containing the generator’s energized rocks is made of metallate and lead in thick layers. StateCraft – A U.S. fighter pilot who was hit by the black hole energy while dropping test weapons. He gains the ability to warp air and control weather in his proximity. His body can also fly with unmatched speed. General (Marlin R. Stilwell) – Commander of the government’s black op forces, assigned to manage and control all living things affected by the black-hole radiation. General leads the missions for the false flag alien invasion program. JoAnn “Queen” Pasha – A Keynesian economics professor hit by the radiation while walking to a class lecture. The government recruits her to stimulate the economy with “broken windows.” Tall and cold, she has enhanced strength and the ability to manipulate and control electronics with her mind. The Sophist (Steven Malafox) – A nationalist who seeks to make the state great again with his sophistry. He has the ability to hypnotize and cause confusion with his mind. His talents are often used for statist crowd control. Bureaubats: When the government offered a $5,000 bonus to current government employees to participate in a new vaccine study, the results turned tax parasites into blood-sucking monsters! The “vaccine” was actually a test drug with nanorobots intended to mutate human genes with bat genes, leading to vampiric outcomes. The government workers awaken during the night, growing fangs and seeking out the last drop of blood they can draw from those they already leach from. The Bureaubats have enhanced speed and strength, and some are even able to sprout wings and fly. The vaccine itself leads only to temporary effects as strong UV light can blind their night-vision eyes and cause temporary paralysis. An electrical current of 50,000 volts or higher can cause the nanorobots to fail, undoing the genetic mutation. Sovereignties – Government robots created by GARPA (Government Advanced Researched Projects Agency) to control protesters after government police and military suffer losses from a Voluntaryist onslaught. Statelee – (Lee Kennedy) A city code enforcement agent who was struck by the cosmic radiation. He gains an ability to control minds of those not affected by the radiation to some degree using a brainwave manipulation. While he still works for the state, he often uses his powers for his own forms of petty tyranny. AnCat – (Jasmine Jones) She was holding her dear cat when she was hit by the black-hole energy. Her cat died, but part of the cat’s DNA was mixed with hers, giving AnCat a chimera “feline sense” for danger and pain of others, enhanced scent power, and springy flexibility. AnCat’s main power is zero-point energy, which allows her to freeze objects within the energy, subject to a strain on her brain much like exhausting a muscle. She also has above-human healing and strength. AnCat’s love for liberty stems from her deep desire for privacy and the government taking away her cats. Volarchist – (Hans Rockwell) A young man from Germany who sold punk anarchist t-shirts as a hobby while living off his trust fund. While he was traveling to America for business, his plane was hit by the black-hole energy and knocked down. He survived and his powers grew. Vollemur – A lemur hit by radiation while in captivity at the zoo. He grows to human size with super-genius brainpower. With keen vision and enhanced hearing, he can connect to the world around him deftly. 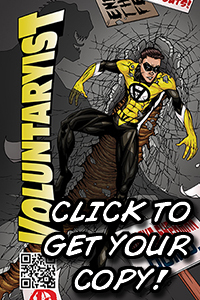 Vollemur closely works with Voluntaryist. He considers himself a trans-primal, one who seeks to bring organic life and technology together (biotech). Mack Lee – A black-ops agent defector. 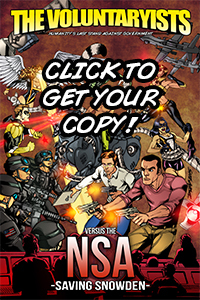 Mack Lee was one of the government’s best agents who was about to become a field director – an agent who acts as the supervisor for other black-ops agents. When Mack leaves on a mission to kill a Chinese spy and collect data, he discovers a plot of the U.S. government to completely enslave America. 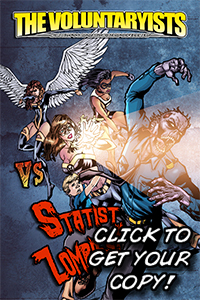 Mack comes to save Voluntaryist and works closely with him to stop the government’s plans. Voluntaria – (Christine Black) She was a DEA agent whose attitudes toward the state changed when she had to perform a no-knock raid on a residence. During the raid, she watched officers point guns at little children living in the home and was forever changed. On her way home that night, tearful at the wheel, she was struck by the cosmic radiation. She gained healing abilities, super-strength, flight power, the ability to blow ice cold breath, as well as a keen sense of others’ intentions. Her sense is so strong it could be considered a 6th sense for discerning lies. AnarCat – (Voluntaryist animal friend) AnarCat was a regular street cat until she was transformed by the cosmic event. When she transformed, she grew in self-awareness and empathy and became drawn to other Voluntaryist characters. Seeking them out with her new-found awareness, AnarCat joins the Voluntaryist team as a companion of comfort. AnarCat has the ability to heal others by rubbing her head into an injured person. She also has a 6th sense for when danger approaches. AnKid – (Pavan Patel) A young Indian orphan who was struck by the cosmic energy and transformed. He can shift his body shape, materializing various periodic elements and simple compounds. AnKid also has the ability to fly. AnKid is inspired to help his townspeople against the cruelty of his local government when he sees the Voluntaryist team on television. He dons a black and yellow cape and helps his neighbors fight back against a crony local government. VolunCap – A sharpshooter whose aptitude for weaponry is enhanced due to the cosmic event. She uses her skills to help those being disarmed by the government. LumberTarian: A logger whose exposure to the comic event changed his body, allowing him to use his axe to wield cosmic energy. He uses his powers to stop the government from stealing land from farmers and other woodsmen. Voluntasia – A North Korean who escaped barbaric labor camps due to being hit by the cosmic radiation. 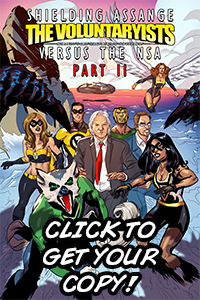 Voluntasia seeks to free the rest of her family from North Korean torture using her teleportation abilities and energy propulsion. Anarcaster – (Gon Takayama) A Japanese magician who was hit by the black hole energy. He can turn himself and anything he holds invisible. He incorporates magic with his energy skills to craftily subvert the state. Bastiat – A mutated Frenchman. Bastiat the ability to vibrate his hands and arms to create concentrated shock waves. He has above-human healing and strength. Spooner (Earl Lorne Jones)– A package deliveryman who was hit by the black-hole energy en-route. Spooner has an enhanced pineal gland which allows for telepathy (speaking to others and listening) and telekinesis. He also has above-human healing and strength. Van Rothbard (Self)– A college dropout hacktivist who was hit by the radiation while sitting at a café. She gains the ability to retain information near-instantly from reading, the ability to mimic what she watches, a genius for creative solution, and the ability to create an energy shield for protection. These things lend to her study of interest – computer programming/hacking. Shadow V (Martin Rodney Smith)– A UK-based engineer. He was hit by the energy while working at a steel mill and his face becomes disfigured because the energy knocked chemicals onto him as he was transformed. He wears black garments with yellow undertones. He can control a smoke-like energy that allows him to float and fly and create shields for himself, much like a loose form of telekinesis. His smoke-like energy can also act as a paralyzing agent and can be thrusted as a physical force. Panarchie (Jane VonHaus) – A coin collector whose collection was hit by the radiation while she was sorting pieces, transforming her with the precious metals. Her body turned into a soft, transparent gold frame with silver linings. Panarchie can mold metals in her hands and manipulate her body to some degree due to the malleability of her metallic composition. She uses her powers to fight the state as the state tries to ban public use of gold and silver as barter. *Woodgrove – A college student who was with his sister, Lil’V, at a park in upstate NY eating ice cream when he was hit by the black-hole radiation. He gains the ability to absorb and modify DNA from organisms he comes into contact with, even to the point of mixing and matching genes for his benefit. With this power also came enhanced healing and enhanced strength. He leaves to NYC with Lil’ V to find out what the supposed “alien invasion” is about and, hopefully, learn about his physical changes in the process. *Lil’ V – A college student who was with her older brother, Woodgrove, at a park in upstate NY eating ice cream when she was hit by the black-hole radiation. She gains super-speed and enhanced healing ability from the impact. She leaves to NYC with Woodgrove to find out what the supposed “alien invasion” is about and, hopefully, learn about her physical changes in the process.